Arcam’s new HDA range comprises an SACD/CD player and two integrated amps | What Hi-Fi? New year, new… fascia? The new range sees the brand’s first design fascia change in 19 years. 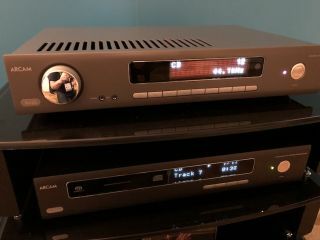 Arcam has used CES to reveal (prototypes of) its new three-strong HDA range, which the company is heralding as its “best performing range of audio products yet”. The range comprises the CDS50 SACD/CD player and SA10 and SA20 integrated amplifiers. Specs are scarce at this stage, but we do know that the SACD/CD player is more versatile than its SACD/CD player category suggests, as it also boasts network streaming. The SA10 (which will replace the FMJ A19) delivers 50 watts per channel of Class A/B amplification, while the SA20 (the replacement for the FMJ A29) is a Class G amplifier that delivers 80 watts per channel. Both amplifiers sport an array of analogue and digital connections – including five RCA, two coaxial and optical inputs – and come with a backlit remote. While we're awaiting price information on the CDS50, the SA10 and SA20 will cost £699 and £999 respectively. All three products will be available in the UK in spring, and we expect we'll see more of them at the Bristol Show in February - and hopefully as finished articles, too (Arcam says the finish of the chrome controls will be darker than they are in the above picture).